The Epson Workforce WF-7525 is a multifunction printer that is devoted to print, copy, fax, and scan and uses A3+ media for printing. It is perfect to use for small business and home office users. It is ideally used by graphic designers, architects and engineers as it contains a perfect blend of affordability, reliability, and speed which makes it all-in-one and efficient than other printers of this range. The printer has a high-capacity 250-sheet paper tray and a 30-sheet Automatic Document Feeder for multiple page scanning copying and other functions. It uses finest printing technology with Micro Piezo print heads, and DURABrite Ultra ink system for its 4 colour Epson Workforce WF-7525 Ink Cartridges to get the print resolution of 5760 x 1440 dpi, and the flatbed colour CIS scanner optical resolution of 1200 x 1200 dpi. Furthermore, the printer forms flexible connections using the high-speed USB 2.0 to Ethernet, Wi-Fi and WPS setup for quick installation. Additionally, its users can print from anywhere in the world as it uses Google Cloud Print and is AirPrint Ready which enables its users to print emails, photos, web pages and documents directly from an iPad or iPhone. The Epson Workforce WF-7525 printer can perform multiple printing tasks efficiently, though it is quite bulky that weighs 18.9 kgs and measures 559mm wide and 365mm tall making it difficult for areas with limited spaces. The printer offers excellent connectivity options on different platforms, so printing from different devices and media becomes easier with it. What should be done if there are incorrect margins on printouts? You can use the preview option given in your printer software to check the margins before you print. How to remove white or dark lines in the printout? What to do if incorrect colours appear on the printouts? The printed colours can never exactly match the on-screen colours. However, you can use a colour management system to get the closest match. For the best results, use only high-quality Epson ink and paper. Q. What types of memory cards are compatible with the Epson Workforce WF-7525 printer? A. The Epson Workforce WF-7525 printer supports memory cards such as xD-Picture Card Type H, xD-Picture Card Type M+, xD-Picture Card Type M, xD-Picture Card, MMCplus, MMC, SDHC, SD, MagicGate Memory Stick, Memory Stick PRO, Memory Stick, MicroDrive, Compact Flash, MMCmicro, MMCmobile RS-MMC, MicroSDHC, MicroSD, MiniSDHC, MiniSD, MagicGate Memory Stick Duo, Memory Stick Micro M2, Memory Stick PRO-HG Duo, Memory Stick PRO Duo, and Memory Stick Duo. Q. 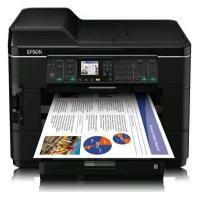 Does the Epson Workforce WF-7525 printer support any mobile and cloud printing services? A. The Epson Workforce supports mobile and cloud printing services like WF-7525 printer Epson Connect (iPrint, Email Print), Apple AirPrint and Google Cloud Print. Q. Do you provide any multipacks of Epson Workforce WF-7525 Ink Cartridges? A. Yes, we have multipacks of Epson Workforce WF-7525 Ink Cartridges available on our website. Q. Does the Epson Workforce WF-7525 printer have an automatic document feeder(ADF)? A. Yes, this printer has an Automatic Document Feeder. Q. My printer usage is extremely heavy. Does your site provide any high capacity Epson Workforce WF-7525 Ink Cartridges? A. Yes, we have a set of high capacity Epson Workforce WF-7525 Ink Cartridges available for Epson Workforce WF-7525. These are called Epson T1305 cartridges and have higher capacity than Epson T1295 cartridges. Q. Can I take prints directly from my iPhone X using the Epson Workforce WF-7525 printer? A. Yes, you can do so by using the AirPrint application. AirPrint enables users to print emails, photos, web pages and documents directly from Apple devices such as iPad, iPhone and iPod Touch. Q. Do you guarantee a security of my credentials while conducting a transaction for Epson Workforce WF-7525 Ink Cartridges? Q. What is the weight and dimensions of EPSON WORKFORCE WF-7525 printer? A. EPSON WORKFORCE WF-7525 is quite bulky printer with 18.9 kg weight and 559*418*365 (W*D*H) measurement. Q. Does this printer support wired connection? A. Yes, this printer supports wired connection. It comes with USB Port and Ethernet connectivity. Q. Will I get any refund if the EPSON WORKFORCE WF-7525 ink cartridges get damaged during transit? A. Yes, we’ll place a refund for your order if gets damaged during transit. You should contact us immediately giving the details about the damage incurred to the parcel and we will help you out with the solution. Q. What type of paper trays are used in EPSON WORKFORCE WF-7525 printer? A. The printer uses duplex and dual paper trays, designed for both home offices and small businesses. Q. What is the warranty period of EPSON WORKFORCE WF-7525 Ink Cartridge? A. These ink cartridges are 100% guaranteed and provide warranty of 12 months. The cartridges are certified as well. Q. What comes along with EPSON WORKFORCE WF-7525 printer? A. The printer comes with A3 automatic Document Feeder, Ink Cartridges, Power Cable, Setup Guide, Software CD and a User Manual. Q. I'm looking for an affordable and good quality ink cartridge for my EPSON WORKFORCE WF-7525 printer. Can you suggest me one? Q. Is the printer suitable for small business set-up also? A. Yes, you can use this printer for small business set-up also. Q. My main purpose to use a printer is to print photos. I need a replacement for my Ink Cartridge, to get quality photos. Can you suggest me one such compatible Ink Cartridge that can meet my needs and budget. A. EPSON WORKFORCE WF-7525 Ink Cartridges would be a perfect choice for you to get high quality resolution photos. These cartridges come in black, cyan, yellow and magenta colours and are good enough to print coloured and clear photos. Also, the cartridges cost you lower than the original ones, with the 12 months guarantee period. Q. I am getting poor quality prints from my EPSON WORKFORCE WF-7525 printer. Do I need to replace my cartridges? What is the possible solution? Please suggest. A. No, replacing cartridges is not always necessary. A blocked printhead can also be the reason. You can clean the clogged printhead and make a test print on the paper you inserted earlier. If you still getting blurry and low quality outputs, we would suggest you to replace your old cartridges with the new ones. Q. What are the multipacks and colours available for EPSON WORKFORCE WF-7525 Ink Cartridge? Q. What is the Ink Volume for your cartridges? A. The Ink volume for black colour is 15ml and 13ml for yellow, cyan and magenta colour. Q. Can I use compatible EPSON WORKFORCE WF-7525 Ink Cartridges with the original ink cartridges for this printer? A. Yes, our compatible ink cartridges will perform absolutely fine with the original inks in the printer. Q. Where to get support from in case of any query? A. You can either call on 048 3083 3221 or send your query on info@printerinkcartridges.ie.